The panda's diet is over 99% bamboo. Pandas in the wild will occasionally eat other grasses, wild tubers, or even meat in the form of birds, rodents or carrion. In captivity, they may receive honey, eggs, fish, yams, shrub leaves, oranges, or bananas along with specially prepared food. The giant panda lives in a few mountain ranges in central China, mainly in sichuan province, but also in shaanxi and Gansu provinces. As a result of farming, deferorestation and other development, the panda has been driven out of the lowland areas where it once lived. 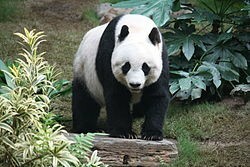 Pandas are an endangered speices. there are about 1,500 living pandas in the wild and around 300 in captivity. the number of pandas is on the rise, but very slowly.